LAHORE: University of Central Punjab (UCP) Pro-Rector Prof Dr Muhammad Zafarullah formally inaugurated the 0.5 MW grid-tied solar power plant installed at the varsity’s Lahore campus. 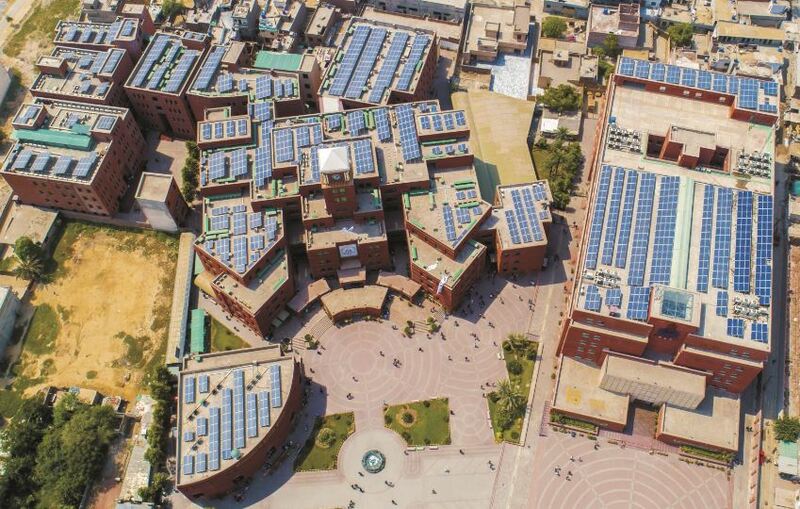 UCP said to be the first university in Pakistan to convert to solar energy for electricity production. With the installation of a 0.5 MW grid-tied solar power plant, UCP will be experiencing a production of 710 MWh per annum, consequently reducing the carbon emission by 392 tons every year. The said installation was successfully completed and commissioned in a record period of 3 months. On this auspicious occasion, an MOU was also signed between UCP and Premier Energy. Under this MOU, both the partners will collaborate in sharing the knowledge base, database, human resource, conduct training and workshop, set up a solar lab for practical training of engineering students and relevant activities to bridge the gap between academia and corporate sector, resulting in a long-term mutually beneficial relationship. The day was concluded with a symbolic walk in favour of green energy titled as “Green Walk 2018” featuring all distinguished guests, head of departments and esteemed faculty members giving their verdict in the favour of renewable energy. The ceremony was attended by eminent personalities including the Punjab government’s Deputy Secretary of Energy Ashar Abbas Zaidi, Chief Engineer (Power) Iftikhar Randhawa, Director International School of Choueifat Margo Abdul Aziz, Lahore Garrison University Vice-Chancellor Lt Gen Obaid Bin Zakriya, Premier Energy Country Head Daniyal Siddiqui and MD & CEO ABB Power & Automation (Pvt) LTD Najeeb Ahmed.